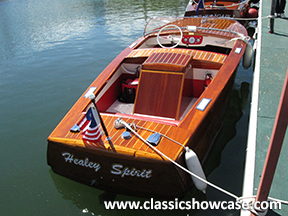 This very rare 1957 Healey Marine 55 Sport Boat has been meticulously restored to its original grace by Classic Showcase. The restoration was complete, comprehensive and documented on a DVD to accompany the boat. All of the wood has been replaced or refinished to a beautiful showable finish. There are many, many coats of varnish that have been sanded between coats. The bottom of the boat is painted in a white epoxy, a very strong durable paint to protect the bottom. All mechanical components and systems have been completely rebuilt or replaced. The engine block was magnafluxed and hot tanked, has new pistons, oil pump, the crank was turned, new bearings, seals, timing chain, etc. The head was completely rebuilt with all new valves, guides, seals as well as the transmission. All other components have been rebuilt or replaced and nothing had been overlooked. A complete new interior was custom fitted, made and installed by Classic Showcase. All gauges restored by Palo Alto Speedometer. A wire loom was made and installed. All of the switches have been restored. New NOS steering wheel purchased and installed and finished in the original color combination. Items have been sourced world-wide for correctness and authenticity. This is a very high level restoration to contend in any boat show. A trailer for the boat will be sold with it as a package. The trailer has been restored, paint stripped to bare metal, sealed, painted white, new tires installed, wheels received new seals and bearings, hardware replaced and all electrical has been re-wired. The second edition of the Healey Sport Boat was fifteen inches shorter than the first model. The larger white steering wheel was mounted on theleft side of the cockpit.